Just when you thought they were dead, all but forgotten and seeped in 80’s pop culture nostalgia, the Mutant Ninja Turtles—are back! 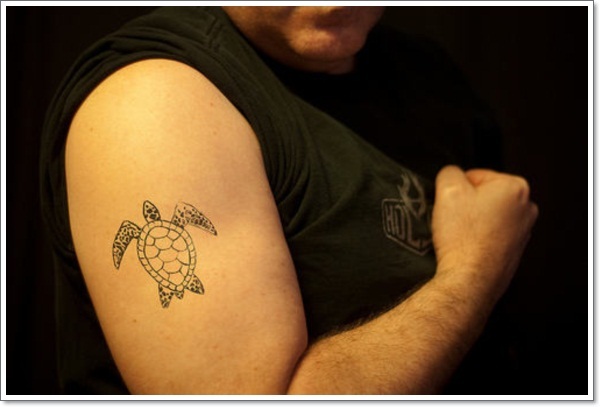 And along with a new film there’s a modern and funky trend in turtle tattoos going down. 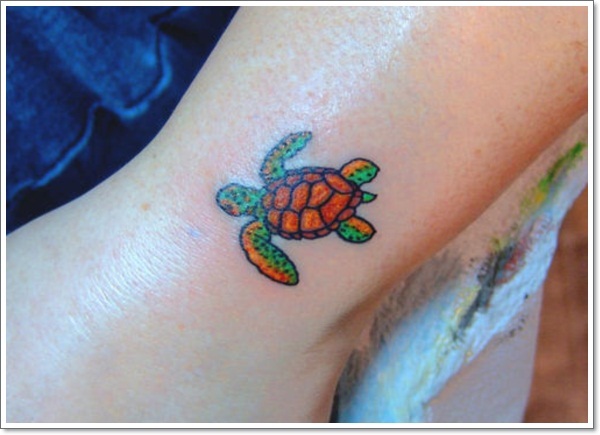 Turtle tattoos are current; whether they are here to stay or will be a fly-by-night trend like their aqua-mates the dolphins before them, only time will tell. 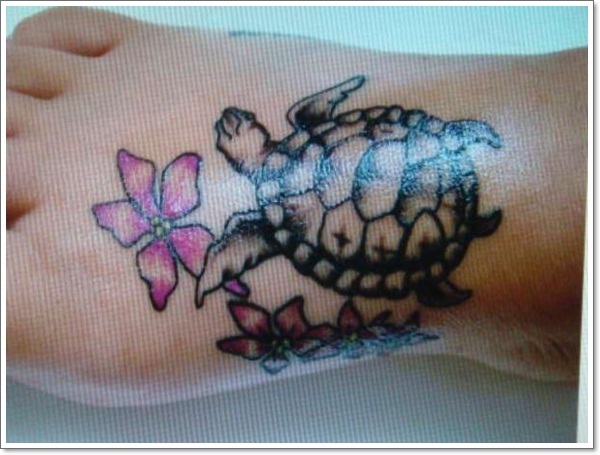 Turtles are found all over the world but are particularly synonymous with the Galapogos Islands and the Pacific Ocean. 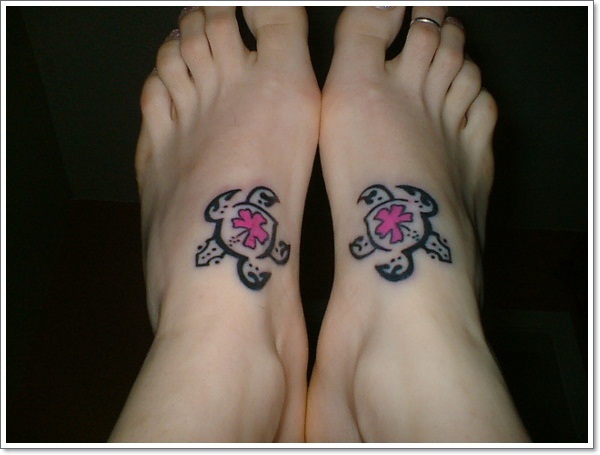 For that reason they have featured in Polynesian tattoo art for centuries but have recently been adopted by Western culture. 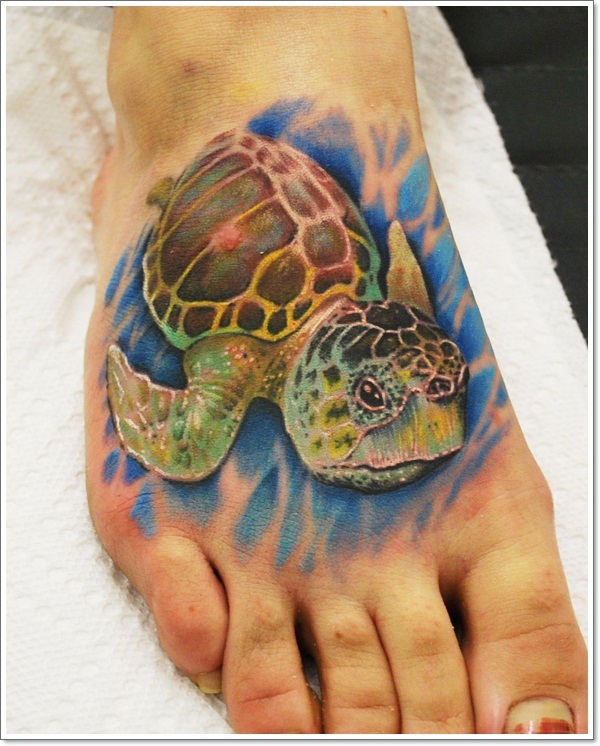 The Pacific Ocean covers one third of the planet and the turtle is a real-life creature seeped in mythical folklore. According to the novelist Douglas Adams, it wasn’t Atlas who carried the world on his back, that honour was accredited to the humble turtle. With its strong shell, stamina enough to cross an ocean and its incredible longevity, the turtle has been the stuff of legends in many cultures for centuries. In olden Polynesia, tattoos had greater significance than just being body art. They were talismans for protection and were a means of communicating hierarchy in a non-writing society. 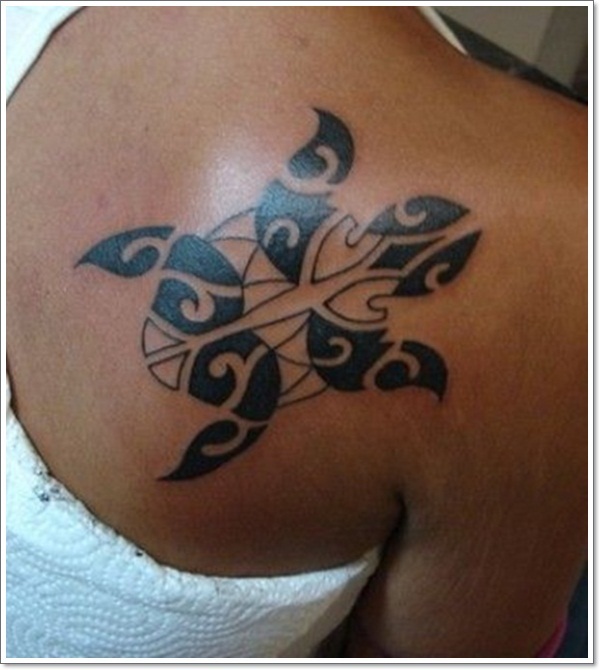 Their turtle designs are stylised by black inked tribal work in the traditional petroglyph mode and are one of the three primary icons along with sharks and lizards. 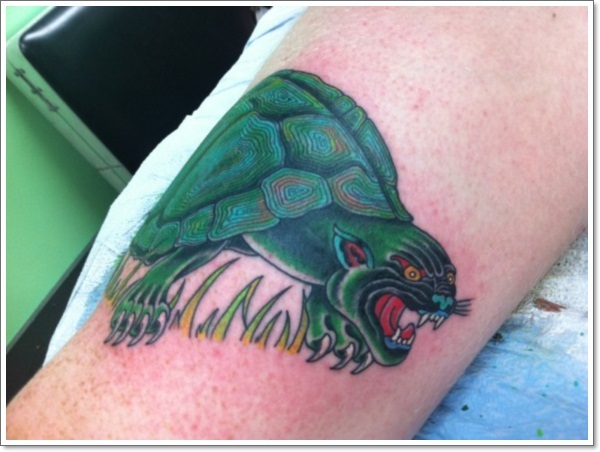 The war God Tu was represented by a turtle which elevated the turtle tattoo to greater importance. In Hawaii, Honu guided settlers to the island. Honu means Turtle. 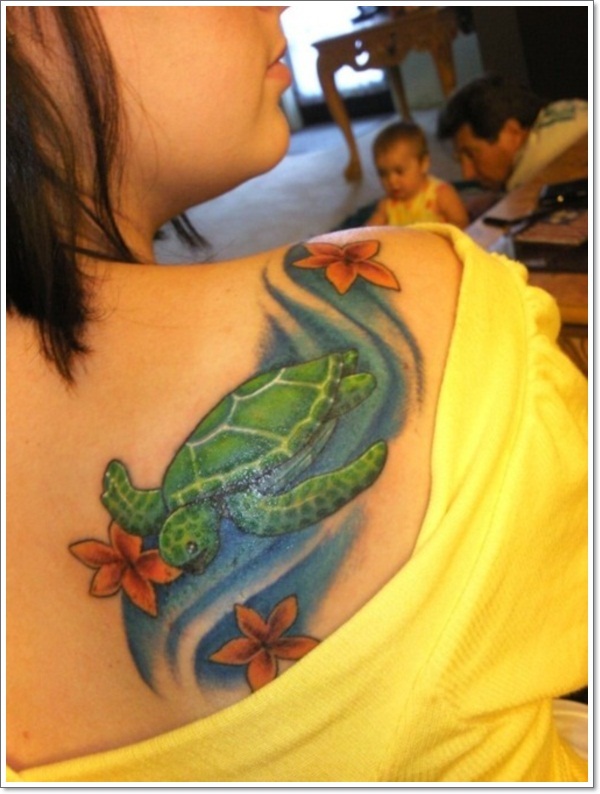 During the first half of the last century, Hawaii was used as a leper colony and the turtle was symbolic of healing, health and well-being. 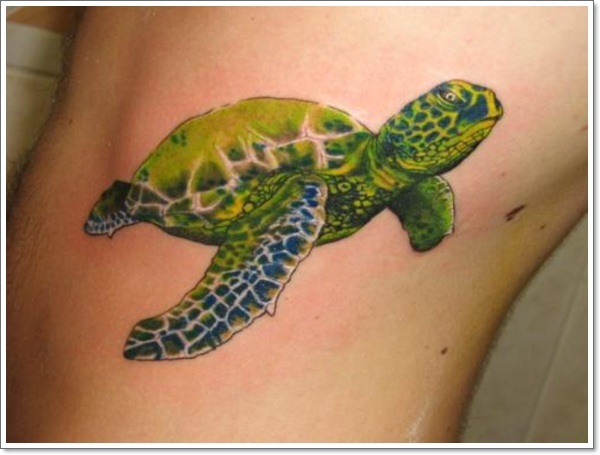 The colonists believed that touching a turtle, or even better, swimming with one would cure their disease. 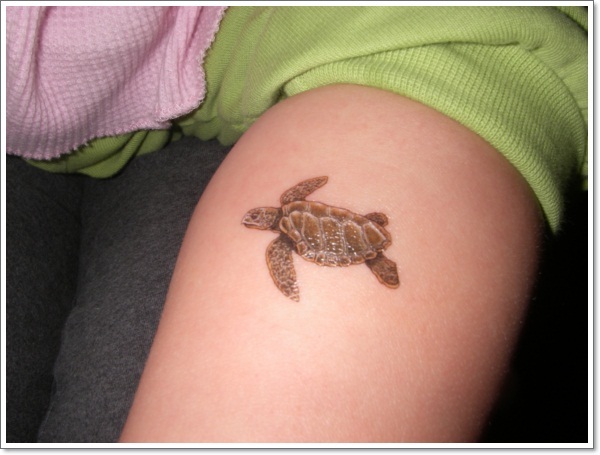 It’s little wonder that the turtle tattoo has its place in many societies around the world. 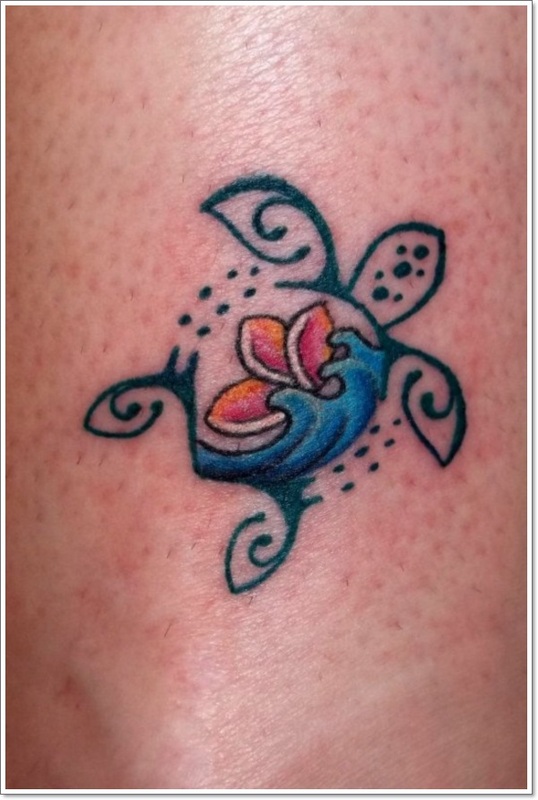 Due to the curved circular structure of the design, turtle tattoos are popular shoulder stamps, they work well on the meaty flesh of an upper thigh, often surrounded by tribal flames and spikes. 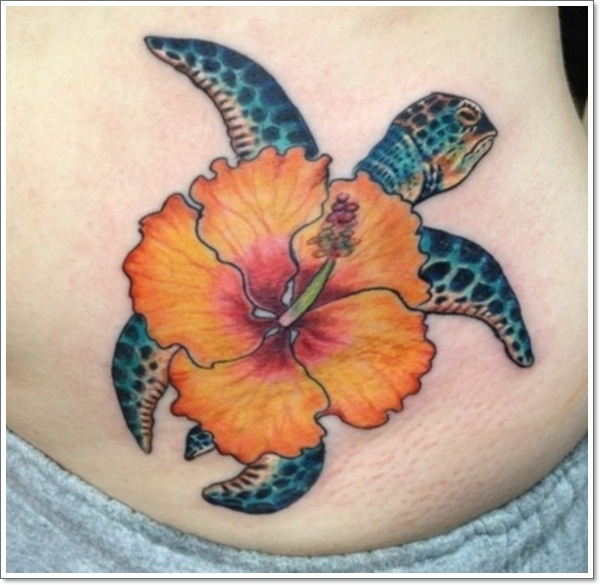 Ribs, particularly on ladies, are also a popular choice of placement. As the body naturally moves and the ribcage inflates and deflates with breathing, the turtle is given the illusion of movement. A good artist will enhance this effect to the best advantage. 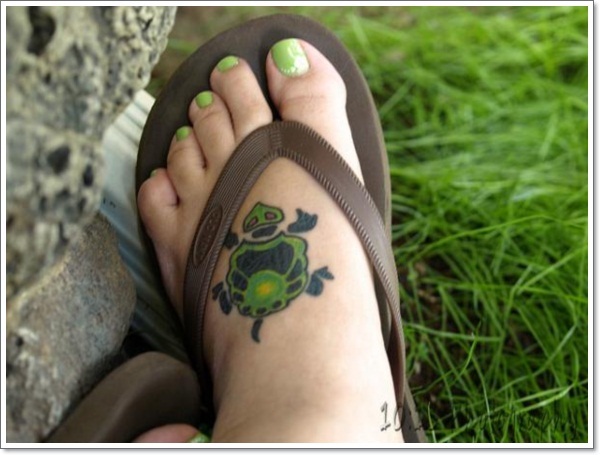 Turtle tattoos work well as a standalone design, but are often twinned with a second one, these work well on the top of the feet, on inner wrists and even on the soles of the feet. 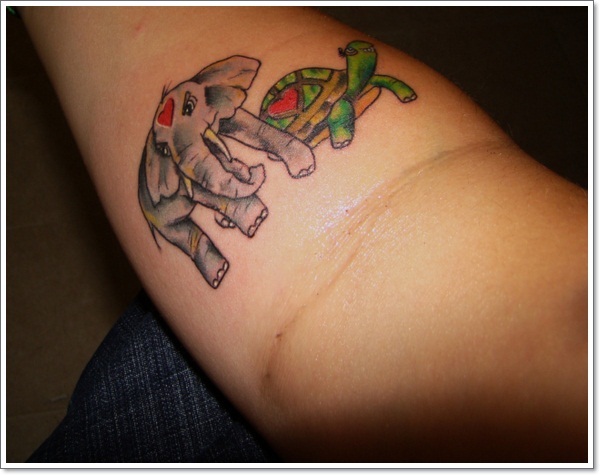 Another dual turtle tattoo design is to have a living turtle on one forearm and a skeleton design of a turtle on the other. They are often combined with flowers for both male and female use, but more often the flowers are used as a softener for the female market. 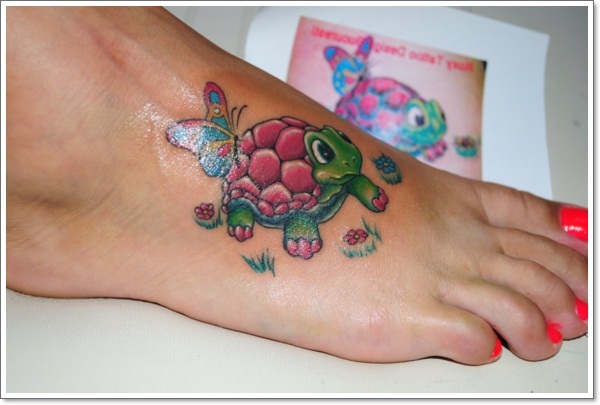 Cartoon turtle tattoos are very popular and are generally depicted as happy characters. 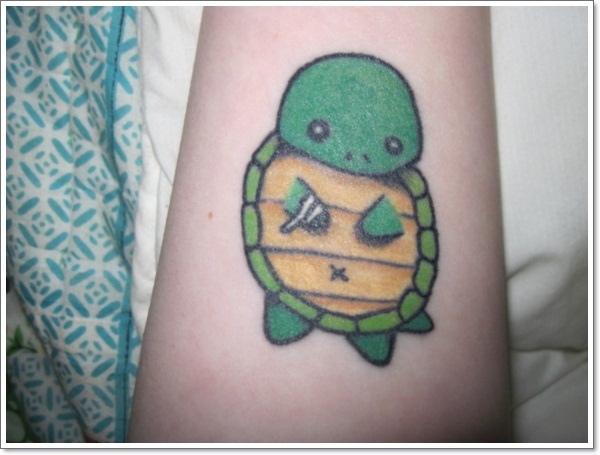 The shape of the turtle face works well with a smile and sometimes long eyelashes. 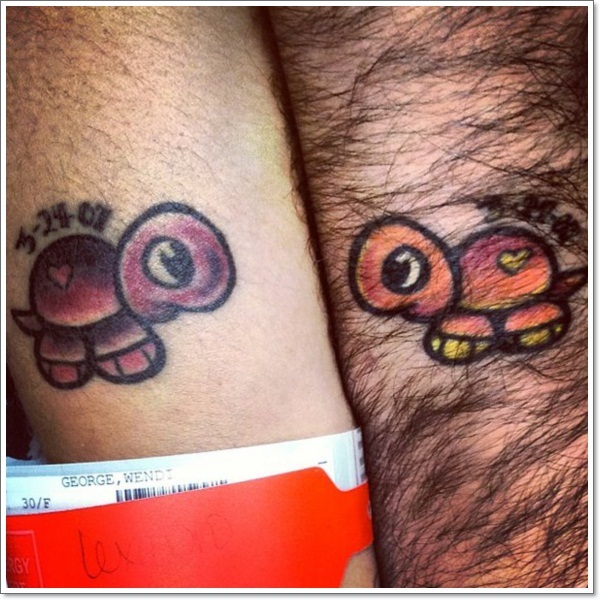 The symbolism of fertility has morphed the turtle into being symbolic of love; sometimes a couple of standing turtles will be holding the traditional red heart between them. 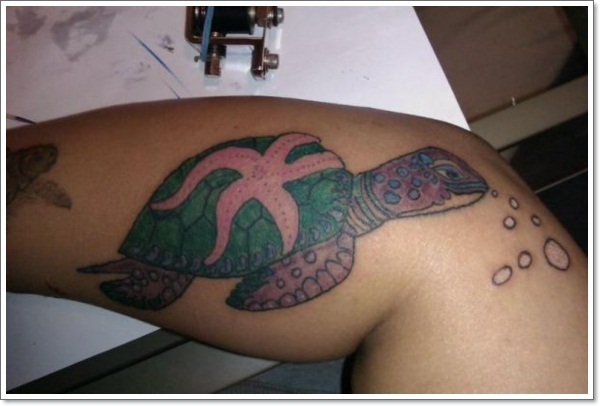 As well as the tribal—perhaps the most common style of turtle tattoo—and the cartoon varieties there are also some stunning and intricate designs around for people whose passion is in herpetology or marine biology. Some of the oceanic scenes are breathtakingly beautiful and often make good use of the colourful coral reefs. 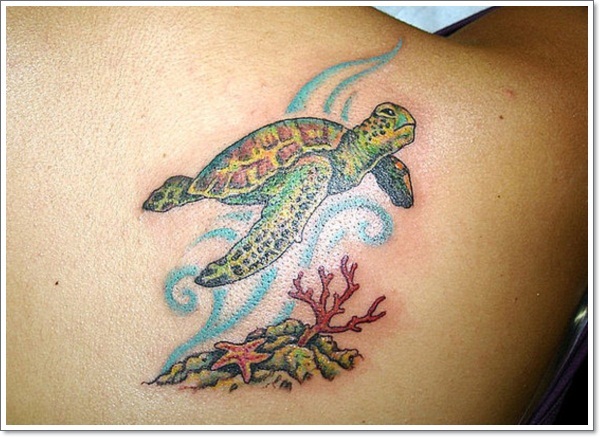 Complete oceanic scenes are most commonly used on back jobs, sleeves and leg covers and are at their most dramatic when they highlight a turtle in a deep, head-downwards dive striving for the beautiful seabed. These scenes are high-intensity, high colour creations of intricate art, incorporating fine line work with bold, stark colour. 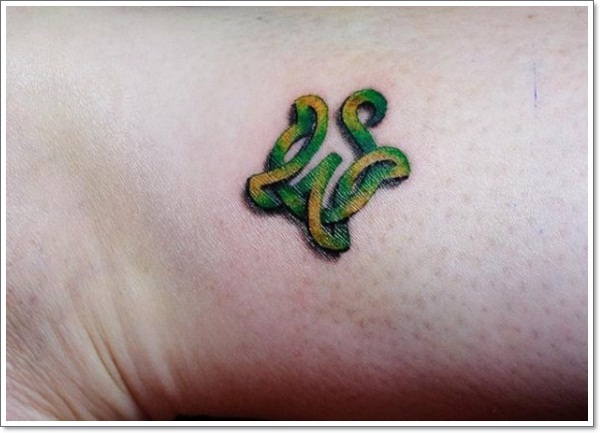 It’s always worth mentioning for somebody new to tattoos that bright, primary colours do fade with time and many people opt for having their tattoos re-inked after ten to fifteen years. 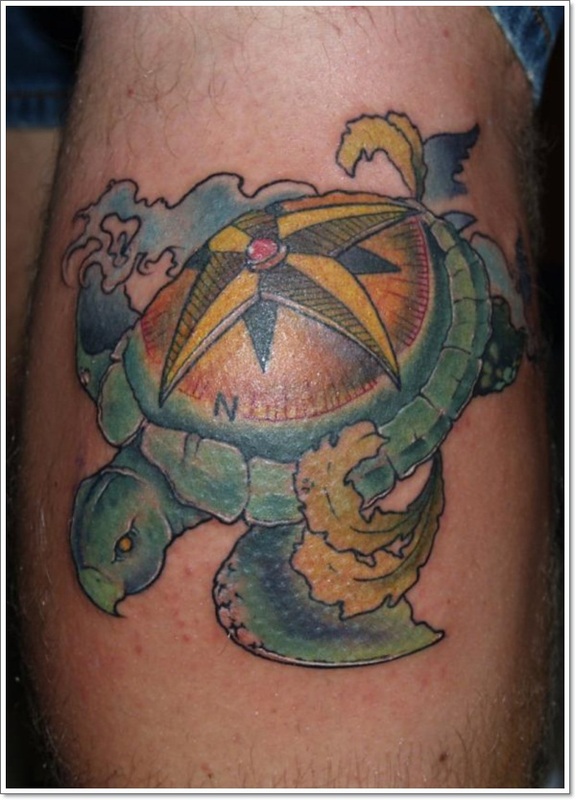 Sometimes turtles are inked with a compass on their back in the romantic belief that, like the turtle, the wearer will always be able to find their way home. Rather than the directional letters N, S, E and W, the wearer sometimes has the initials of their spouse and two children instead. While this works best with a family of four; it still looks good with additional compass points as long as they are placed in multiples of two. This idea doesn’t work well with odd numbered families. Turtles are also used in memorandum, memorial pieces commemorating a deceased loved one, usually with the departed person’s name, birthdate and the date of their passing. 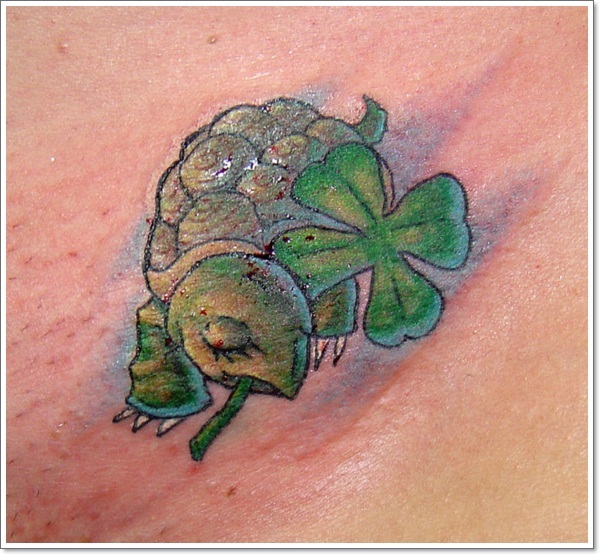 Each to their own and while the turtle tattoo has long been recognised as a symbol of life, long-life and enduring life, it is also seen as a bridge of worlds. 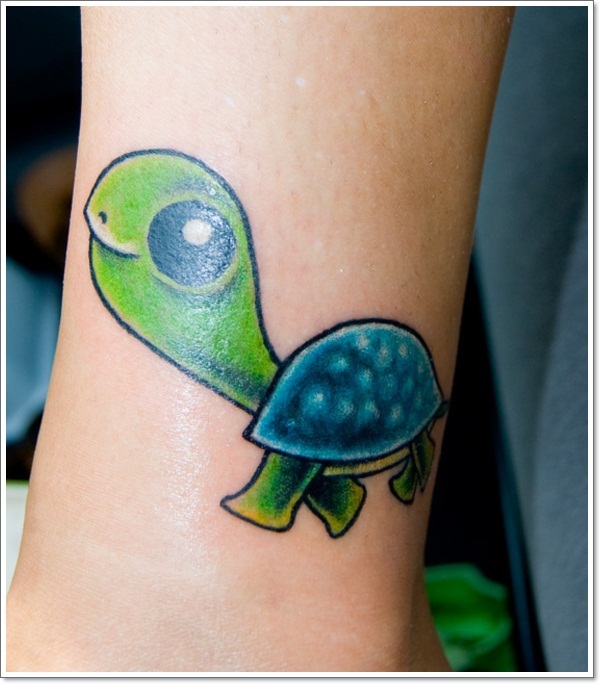 The soul is said to be able to pass over the turtles back from earthly seas to heavenly shores. 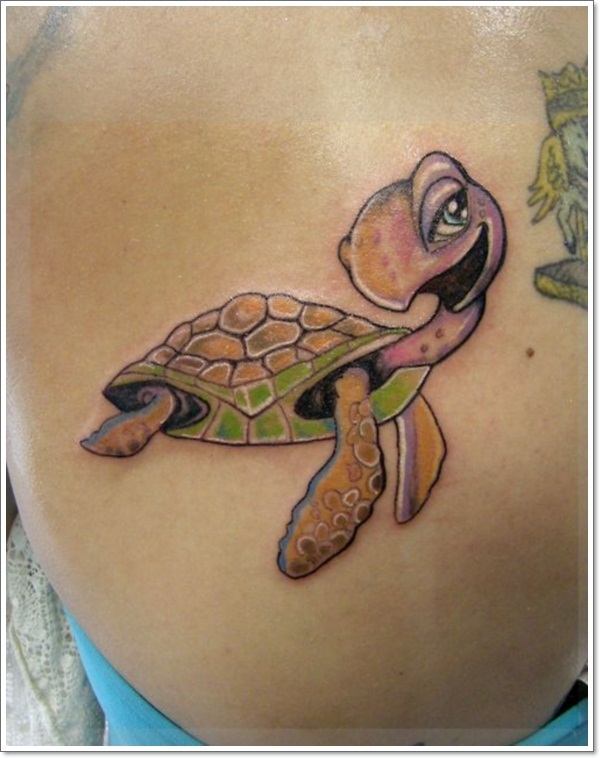 Celebrities with Turtle tattoos include: Rihanna, The Rock and Brittney Spears. 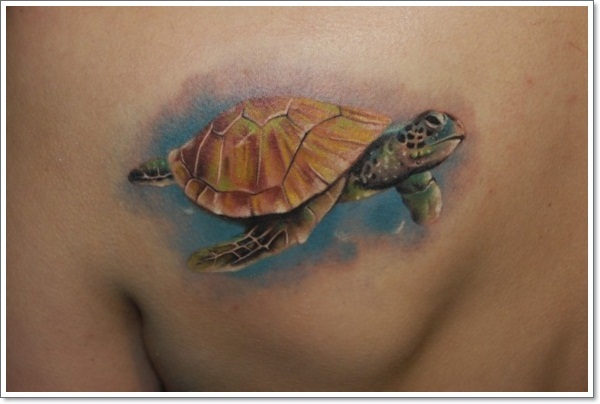 While the turtle is a design in itself, the shell is often used as a secondary canvass. It may stay in keeping with ocean life, depicting other sea creatures on the shell, or the shell may be covered with navigational and nautical scenes. However, sometimes it comes away from the ocean and soars to the skies. 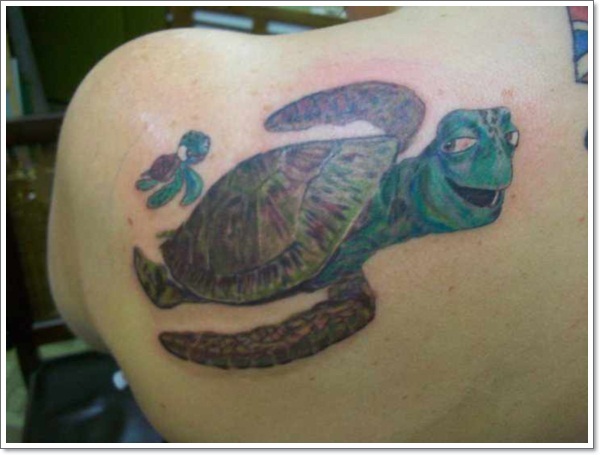 A good tattoo artist can create fantastic designs with the ocean below and a complete galaxy on the turtle’s shell. The turtle is a versatile creature; he’s one of the few creatures whose habitat is both land and sea: another reason why he is so deeply entrenched in mythology and folklore. Sometimes the sub-design on the shell has nothing to do with either sea or skies, though nature is often a common theme. 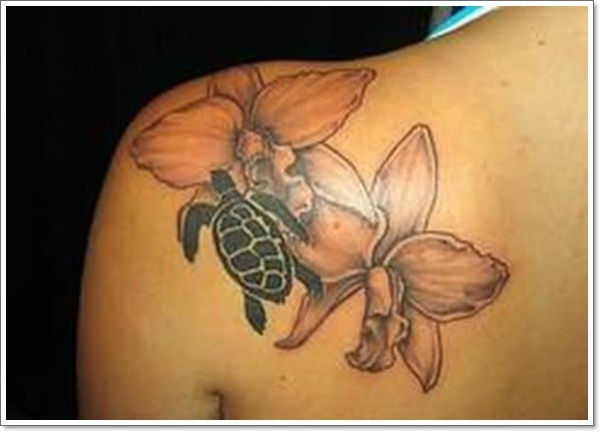 Flowers are popular both for adornment around the turtle and as a second canvas on the shell. Leaves and garlands are also very popular. There are even some spectacular children’s portraits drawn in exquisitely fine detail on the turtle shells. 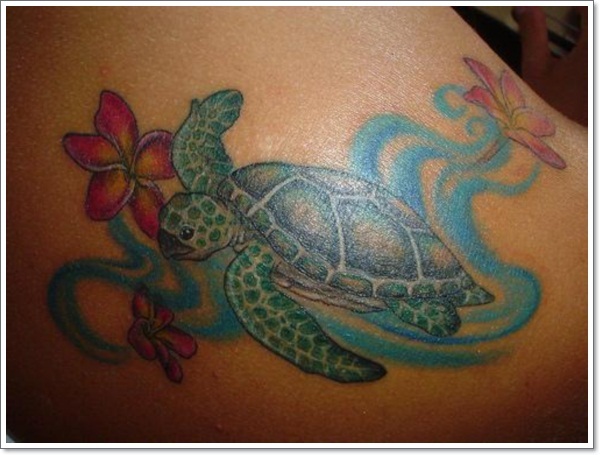 Turtles feature heavily in Japanese tattoo designs and compliment the likes of lotus blossom well. 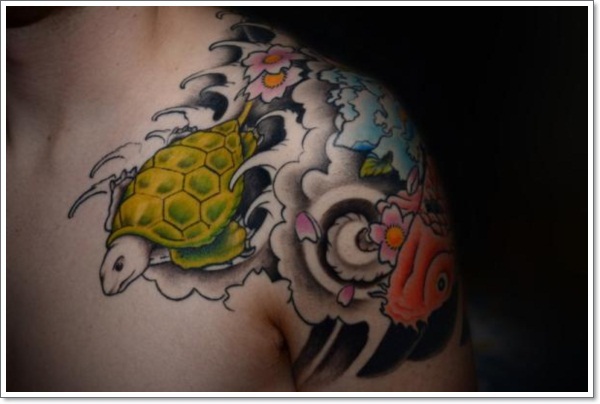 A popular choice is having a shoulder pad in vibrant colours, often with clouds in black and grey work, lotus flowers, Koi carp and turtles. The beauty of Japanese work is that it is instantly recognisable as a Japanese scene regardless of what it depicts. 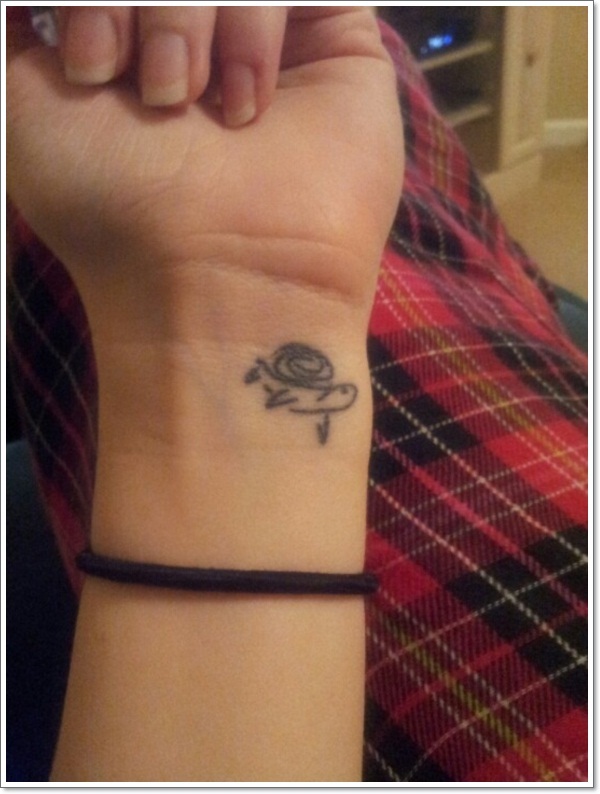 Next articleHere are the answers to some of the FAQs asked about tattoos!